“Goudelock’s is one of those stories so frequent around pro basketball, the guy from the small school (College of Charleston), drafted low (second round No. 46) who gets squeezed out of rosters by guaranteed contracts, a tweener who is a bit small for shooting guard but not a classic point guard, spends time in the minor league,” writes Smith. They just about all went in as the scoring star of Las Vegas, Andrew Goudelock, Monday in the Bulls win added 31 points on 10 of 13 shooting with five of six threes in just 29 minutes. And it’s been the most impressive thus far as the backcourt of Goudelock with Marquis Teague has been dominant, the Bulls Monday losing leads when they left and then putting big runs on the Nuggets squad when the duo returned. They were supported by power forward Malcolm Thomas, who had 13 points and a summer league record 22 rebounds, and second round draft pick Erik Murphy, who had 18 points with four of five three pointers. First round pick Tony Snell had 11 points. He shot just two of nine, but he was seven of nine on free throws as the Bulls used him more on driving plays than catch and shoot or in classic two guard situations. Murphy, actually, played more two-man game behind the three point line with Teague, popping out for threes and shooting exceptionally well. He’ll play so called stretch four more as he had just two rebounds and banged around for seven fouls without foul outs in the summer. In addition, Teague shot the ball well from the perimeter. He was six of 12 overall, more on jumpers this time, and made his only three point attempt. Again, he ran the team well and made some brilliant passes off the dribble, including the highlight play of the game late in the second quarter when he beat backcourt pressure, went full court and got into the lane and then handed off to Thomas for a sledgehammer slam dunk for a 37-35 Bulls halftime lead. The Bulls had led 20-14 after one quarter, saw Denver take a 27-23 lead with Teague and Goudelock out, closed the half with a 13-5 run with their return and then blew the game open with a 27-12 start to the second half. The Bulls guards went out and Denver closed within 66-58 after three. But then Teague and Goudelock with jumpers, Goudelock with back to back threes, left the Nuggets’ kids waving goodbye. And the question now is whether Goudelock will be running from the home of the many Bulls after this summer league run. He may just be too good to chase away the way he’s played with poise and shooting skill. Although the Bulls are believed to be holding one more roster spot for a big man to backup Joakim Noah, the play of free agent Goudelock may be too special to allow him to get away. He can sign with any team. 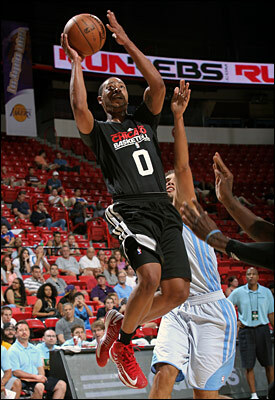 And he should be in demand as everyone needs shooters, and Goudelock looks very good and confident. But even with the addition of Mike Dunleavy Jr., it would be nice to have another confident shooter who can play off Derrick Rose. But Goudelock, who had stints with the Lakers the last two seasons and even scored 20 points in a playoff game against the Spurs after Kobe Bryant was injured, has spent his basketball life, as he says, “grinding.” So it’s nothing new to him, more a way of life. He believes in himself and his ability, and he’s showing he’s an NBA player. “I’ve been frustrated,” the 6-3 Goudelock concedes. “You look around and think, “I’m better than that guy.’ No disrespect to anyone, but I’m better. ‘He just got signed. Why am I not getting signed?’ But you’ve got to pay your dues. The way the league works some guys get different opportunities at different times, contract situations. There’s a lot that goes into it. But you’ve got to keep pushing. I’ve fought hard. Teams know. They do their research. They see me grinding. I’ve always been grinding. That mental aspect of the game is big. A guy that has no confidence, a guy who is weak mentally, is not going to do well. He could be more talented, but that next person is more hungry and can outplay that guy. That’s how the game works, how life works. You’ve got to be strong mentally going into different situations to be successful. He’s done that in the Bulls first two games with 26 points in the opener and then 31 Monday, both in fewer than 30 minutes. His shot has been true, he’s been good at creating space to get his shot, especially making a move into the paint and stepping back to around 15 feet. And he has a nice floater that been effective. He’s hustled after loose balls and finished at the basket. And he’s played point guard as well, running the offense effectively, and his range has been way beyond the NBA three pointer with effortless efficiency. Though he isn’t your typical rookie as he was with the Lakers 40 games in the 2011-12 season and after Bryant was hurt last season. In between the 24-year-old was in the D-league. But he never let down as his team won the title and he was named league MVP. It’s been something of the story of Goudelock’s walk in the basketball forest. He is from Georgia. His family did some moving around and he was in a new school in 10th grade. He barely made the team and eventually became a starter. But he wasn’t much recruited with only offers from Kennesaw State and Charleston. Then he gets to Charleston and the coach leaves. His first college game he came off the bench and got 20 points. As a senior, he averaged 23.4, fourth most in the country and had the nation’s second best three point percentage. But same old stuff. But Goudelock showed well in the draft camps and worked his way into the second round for the Lakers, spending two seasons traveling between L.A. and all sorts of D-league destinations. But he said that’s just the road for him. “That experience, those two years, was invaluable,” says Goudelock. “Playing with and against Kobe just about every day. You have no choice but to learn from that, playing against a legend. The guy even when he was hurt was giving me advice I still think about. Being around so many talented veterans you grow as a person and player and learn about the game and the business. Being around Derek Fisher, Steve Nash this year. What I learned I’ll take to the grave. I’ve got some amazing stories. Goudelock plays like that. Not like someone worried about every shot, but like a pro who expects to be one for a long time. He speaks with a confident authority, though hardly arrogant. He says he wanted to play with the Bulls summer league team because he feels he can help the team and has appreciated the Bulls interest. “Those guys have steadily shown interest. Since I’ve been in the D-league, they’ve been calling, calling,” said Goudelock. “When things started happening for me with the Lakers, they were calling, asking questions, always kind of interested. It seemed the best fit for me, especially with these guys losing Nate (Robinson), Rip (Hamilton). (Marco) Belinelli left, Daequan Cook left. Those are all guard positions and I feel I can step in and fill one of those positions. “I feel I’m ready to play,” Goudelock says. “I’ve had experience, going into my third year. I think this is a good fit. Like a nice bowl of porridge that may be just right.